Who Has the Cheapest Renters Insurance Quotes in Washington DC? Washington DC is home to thousands of renters to whom we highly recommended renters insurance. Luckily, in DC going with the right company can mean paying less than the cost of a lunch for thousands of dollars worth of protection every month. We analyzed several companies that offer renters insurance in DC neighborhoods to see which offered the best and cheapest rates. We found State Farm was the cheapest overall, but other companies may be better depending on your circumstances. Read on to find which renters insurance company in DC is best for you, then put your information up top or below to start a quote. We reviewed five companies in DC that offer renters insurance. We found State Farm had the cheapest renters insurance in DC offering policies for $25,000 worth of coverage for less than $11 per month or $134 per year. Other affordable renters insurance companies included Progressive and Nationwide, though State Farm was much cheaper than both. Between the five companies we found the average price in DC to be $242 per year. The average annual premiums was the same for all neighborhoods, from Anacostia, Adams Morgan and Brookland all the way to U Street, Upper Northwest and Woodley Park. Your actual quote may differ a bit depending on if you ask for more coverage, have more people living in your home, or have filed claims within the last five years. The cheapest company may not always be the best renters insurance company. Different companies may be better for certain circumstance that make price a secondary factor. Below we detail what some companies are best for. As we discuss above, State Farm ranked as the least expensive renters insurer in DC - regardless of whether you're renting at Dupont Circle or Logan Circle. In addition to the price however, State Farm scores relatively well for customer satisfaction. According to the J.D. Power 2016 study of renters insurance companies, State Farm gets 4/5 stars for things such as customer interaction, or how well the company's agents interact with customers. If you have no special circumstances, or are confident you probably won't even need to file a claim in the future, State Farm is probably the best company to go with if you're in DC. We were not able to acquire the Hartford/AARP renters insurance quotes, but the JD Power study ranks them as the best renters insurance company with 5/5 stars. The policies they offer, their method of billing, as well as their customer interaction rates 5/5 stars. The only issue with the company is their prices tend to be a bit higher. They get 3/5 stars for price, so expect them to be a bit more expensive than State Farm. If having a smooth a claims process as possible is important, Washington DC renters should consider going with the Hartford. While GEICO tends to be costlier for renters insurance, it may be an attractive option if you also need to buy car insurance. For car insurance in DC, the best price is at GEICO. In fact, we found GEICO to be about $200 cheaper than State Farm for auto insurance premiums. The bundle of your renters and car policy at GEICO would be cheaper than the bundle at State Farm most likely. If you bundle, you also get a discount for both policies. USAA is another company we could not get quotes for, but is known for its exceptional service for military members. If you are or were in the military, you and your family are eligible to become members of USAA. In addition to affordable renters insurance, you can also bundle affordable car insurance as well. This company should definitely be included in many DC residents' short list for quotes, given the large population of navy, army and air members living in the nation's capital. What you may not know about renters insurance is that it covers theft. Should your possessions be stolen, your renters insurance will cover their worth up to the amount on your policy. Usually you will have to pay a $500 deductible, but that's a small price to pay if thousands of dollars worth of stuff is stolen from you. 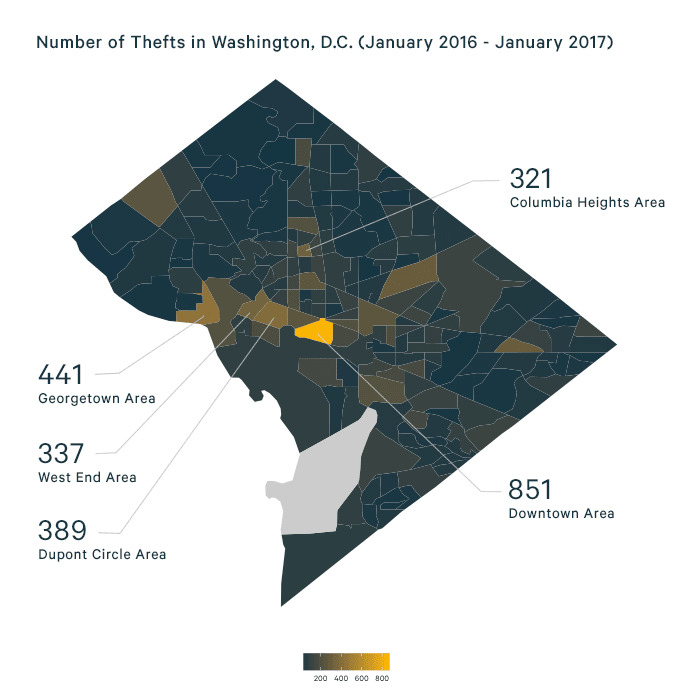 In the map below you can see which areas of DC tend to have a higher incidence of theft. If you find your neighborhood is in a yellow section, we'd recommend getting a renters policy (or homeowners if you own a home). In Washington DC, residents tend to pay a bit less for renters insurance than in other nearby major cities. In Baltimore, rates average $304 per year, while renters insurance in NYC costs around $324 per year. In Philadelphia rates go as high as $588 per year. In most other cities there is some variation in price depending on where you are. For example in NYC, renters insurance in Manhattan is significantly more expensive than renters insurance in Queens. In DC every neighborhood seems to be priced the same. So whether you live in Foggy Bottom, or Washington Highlands or attend Georgetown University in Georgetown, you would be paying about the same for $25,000 worth of coverage (all else equal). To find the price of renters insurance in DC, we went to the websites of GEICO, Progressive, State Farm, Liberty Mutual and Nationwide and got quotes for five different DC neighborhoods. Prices remain constant no matter where you go in DC. We set parameters so we always got $25,000 worth of property coverage, and $100,000 worth of liability. Our tenant was a 30 year old single male. We obtained the theft data from the D.C. data on_current="true".gov website which lists every reported crime in the city. Who Has the Cheapest Car Insurance Quotes in Washington, D.C.?